A web browser’s interface is created keeping general usage in mind. But not all people use their browser the ‘standard’ way. Some users might need more interface features while some might prefer less. Browser addons and extensions are what fill this tool. They provide us with what we feel the web browser’s interface lacks. Recent History is an excellent example of this. 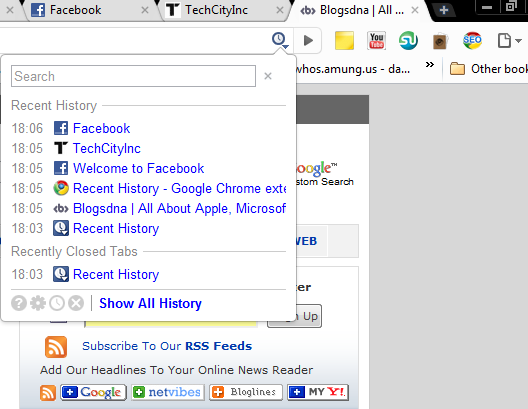 Recent History is a browser extension for Google’s browser, Chrome. 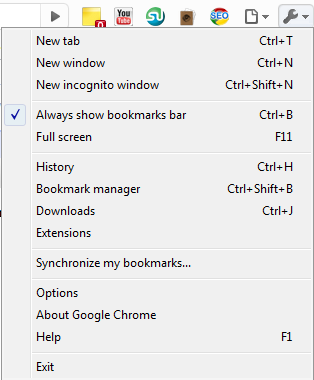 By default, if we want to view our browsing history in Chrome we can either use the entry in the main menu or use the hotkey shortcut CTRL+H. Left clicking any History entry opens it in a new tab; right clicking any entry in this window copies its URL to the clipboard. The buttons at the bottom of the menu lets us access the extension’s options and delete our browsing history. 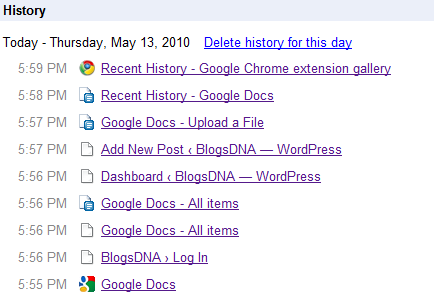 We can choose to delete everything in one go or delete History entries one by one. Recent History gives us a quick way to open our History and work with it. A nifty extension, Chrome users should definitely give it a try.